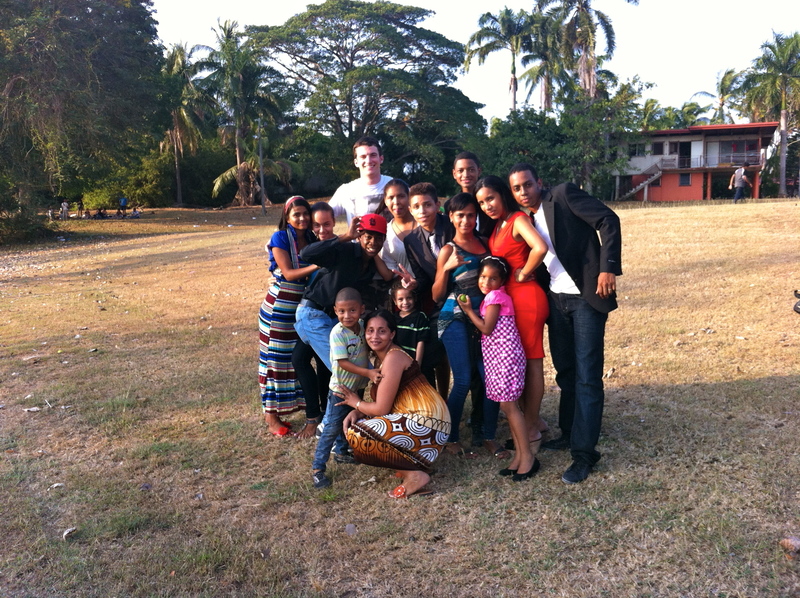 Although I have a lot of travel experience, convincing the parents to go to Panama alone was not an easy sell. I picked the Panama for a number of reasons: it is the safest and most cosmopolitan country in Latin America, it is considerably less touristy than Costa Rica, the airfare was cheaper than any surrounding country, and the currency is the US dollar. After drafting up a sample itinerary (which proves my knowledge of the country) and showing them the airfare (about $500 round trip), they gave me the green light. I normally choose to travel solo for a number of reasons. Firstly, Wash U students are incredibly unreliable and generally unwilling to go out of their comfort zones. The second reason is that I can craft a trip that caters exactly to my preferences and I can be more mobile. I hate having to go home early or change my travel plans because someone isn’t as adventurous as me or is feeling lazy. My travel style is to go all out during the day, go to bed on the early side, and never get drunk (although I will certainly have a couple drinks in a night). This allows me to get up early, experience the day to its fullest, and avoid any dangerous situations that occur from going out late at night. The third reason I usually travel solo is that it forces you to interact with your surrounding. The only way to truly experience a culture is to meet locals. If you have a travel companion, you can always talk to them as a fallback, but when you are alone, you have no choice but to meet other people and hear their stories. This is the most rewarding part of travel. 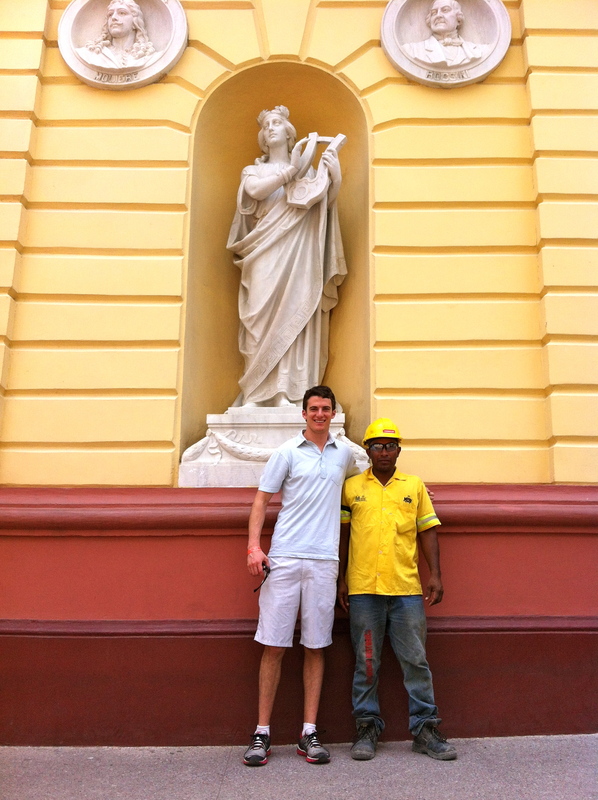 Making friends with a construction worker in Panama City near the National Theater. Even though it was 95 degrees outside, everyone wore pants. Eventually, I adjusted. The flight from Miami to Panama took about 2 1/2 hours. Despite what most people believe, Panama is actually due south of Miami. After landing, I spend about 45 minutes getting through customs before feeling the heat and humidity for the first time. It was 97 degrees incredibly humid. My hostel was in Casco Viejo, $25 and 30 minutes away. The area surrounding the airport looks like a third world country with lots of poorly constructed huts. 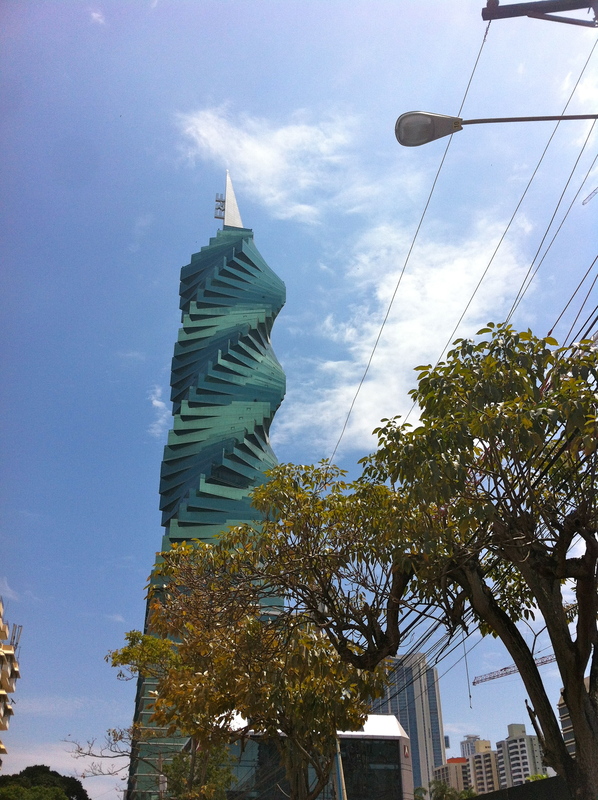 However, all of a sudden the tall white buildings of downtown Panama City came into view. The city looks just like Miami or Tel Aviv- countless glass skyscrapers. I passed the Hard Rock Casino, the Trump Tower and the “tornado building”. 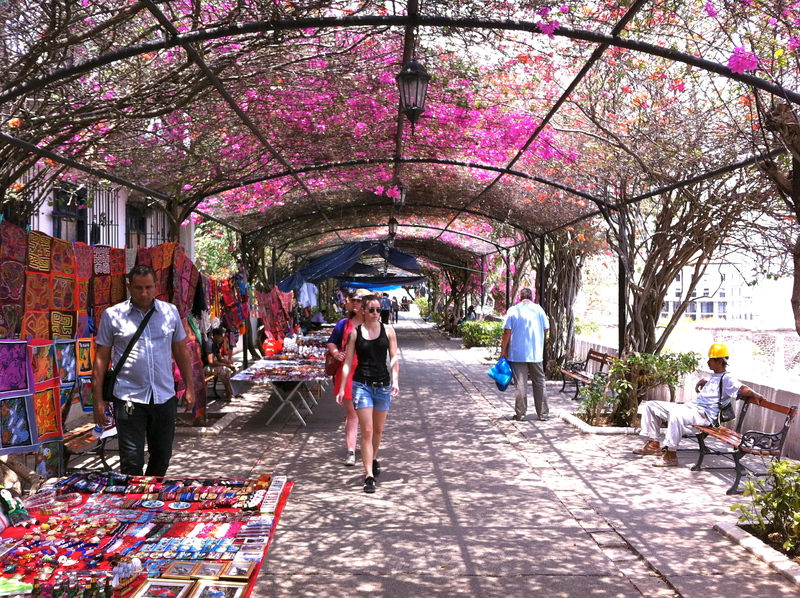 Casco Viejo, Spanish for Old Town, was on a peninsula about 2km past downtown. My hostel, Luna’s Castle Hostel, is located at the edge of Casco Viejo and is the coolest hostel. It has a nice hippie backpacker vibe, the staff is really nice, and the decorations are cool. There’s also a popular bar and a movie theater in the basement. After checking into my room, I walked along the coast about 1km to the local fish market nearby to get a cup of fresh ceviche for $2. The Casco Viejo district is a UNESCO World Heritage Site. 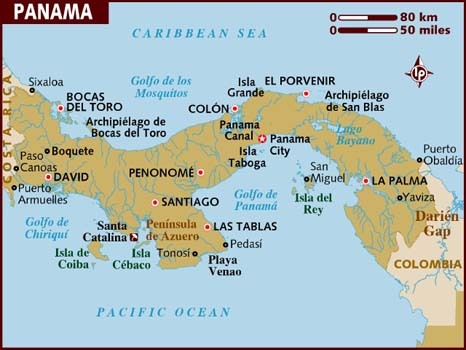 Panama City is actually the first European settlement on the Pacific Ocean, founded in 1519. 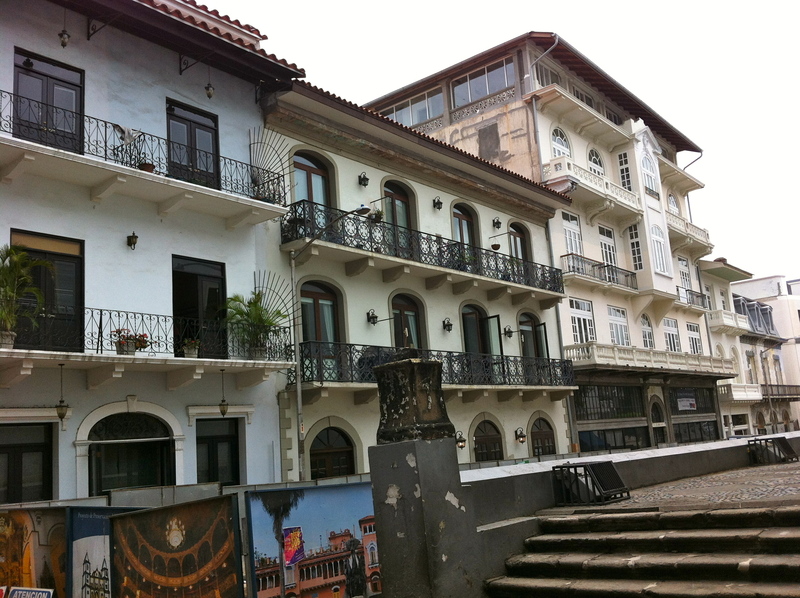 Unfortunately, the buildings in Casco Viejo were only built in 1676. After getting some food and settling into my hostel, I decided to take a walk around Old Panama. Since I arrived on a Sunday, everything was closed. However, it gave me the opportunity to explore the architecture and find my bearings. The streets in Casco are narrow, only wide enough for a single car. The three story Spanish style buildings are a quarter occupied, half dilapidated, and a quarter under renovation. In five years, this place is going to be beautiful, but for now it feels like a ruined ghost town. After realizing that Casco Viejo is best saved for another day when everything is open, I decided to walk in the other direction towards the government center near Plaza de Cinco de Mayo about 1km away. The walk involved going along the Avenida Central, a major shopping pedestrian mall. 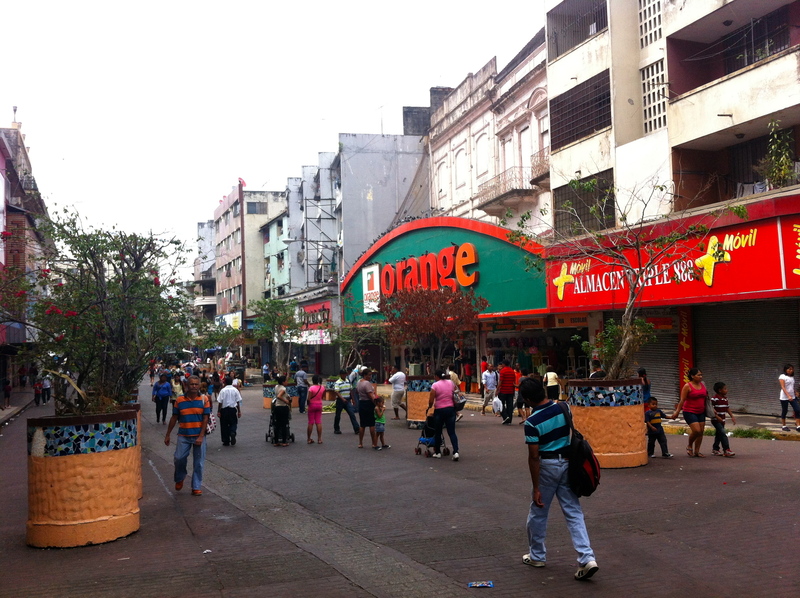 While Casco Viejo was mostly empty, Avenida Central was happening. Street vendors sold fresh fruits including pineapples, mangoes, papaya, and banana while blasted Tropical music (a subgenre of Latin) from their carts. The people watching here was fantastic. While many people wore Western-style clothing, many wore their indigenous clothing: Kuna, Guaymi, and Embera. Being 6’4” and from a temperate latitude made me the tallest and whitest person in all of Panama. Even if I wanted to blend in, I had no shot since everyone on the street stared at me as I walked by. The biggest shock while walking on Avenida Central is the sheer numbers of people and liveliness of the street. The crowds rivaled that of Barcelona and Disneyland. I eventually made it to Plaza de Cinco de Mayo, but was unimpressed by the National Assembly building. It looked a lot like an old office building in West Los Angeles, not the seat of the legislative branch. On the way back to the hostel, I stopped at a supermercado on Avenida Central and bought a gallon of orange juice and a soccer jersey from Nicaragua on sale for just $2. 4 pm shopping on Sunday afternoon. After returning to the hostel to drop off my purchased, I immediately hopped in cab to Amador causeway. Originally owned by the US until around 2000, the causeway is a 1km long narrow strip of land that connects the mainland to 3 small islands in the Pacific. 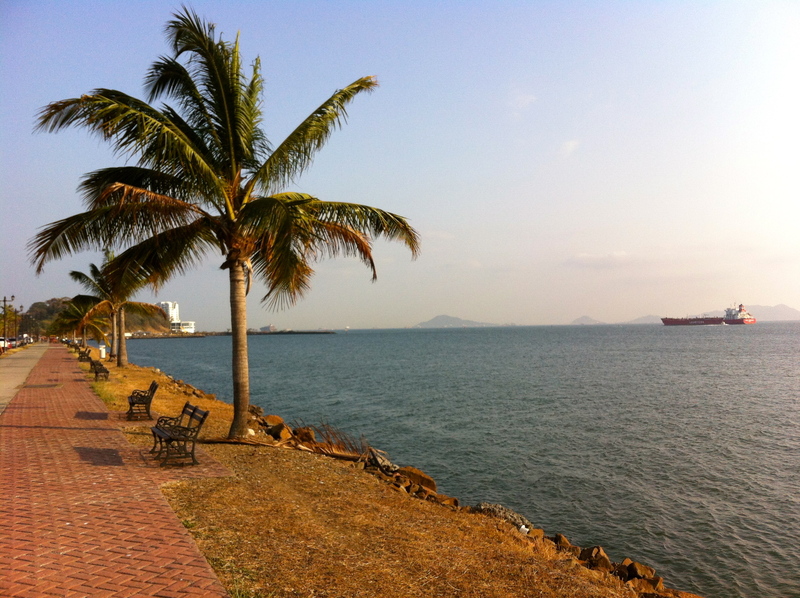 The causeways is a popular day trip for Panamanians, as it is one of the only places in Panama City that has access to clean ocean water. I saw lots of families biking together. After checking out the scene, I ended up walking back to the mainland. The Biomuseo, a semi-constructed museum designed by Frank Gehry (architect of Disney Hall, and the Guggenheim Bilbao) stands where the causeway meets the mainland. While walking next to the museum, I heard a loud “gringo” call, looked over and saw about 15 Panamanian children who wanted to take a picture with me. After taking the picture, a few of the pre-teen girls asked to friend me on Facebook and Whatsapp me. I respectfully declined. A bit past the museum was a yacht club for ex-pats. At the open-air bar, there was a rocking band playing Gimme Three Steps and Oye Como Va. While I enjoyed the atmosphere, the place felt too similar to the United States and nobody seemed interested in talking to me, so I left. 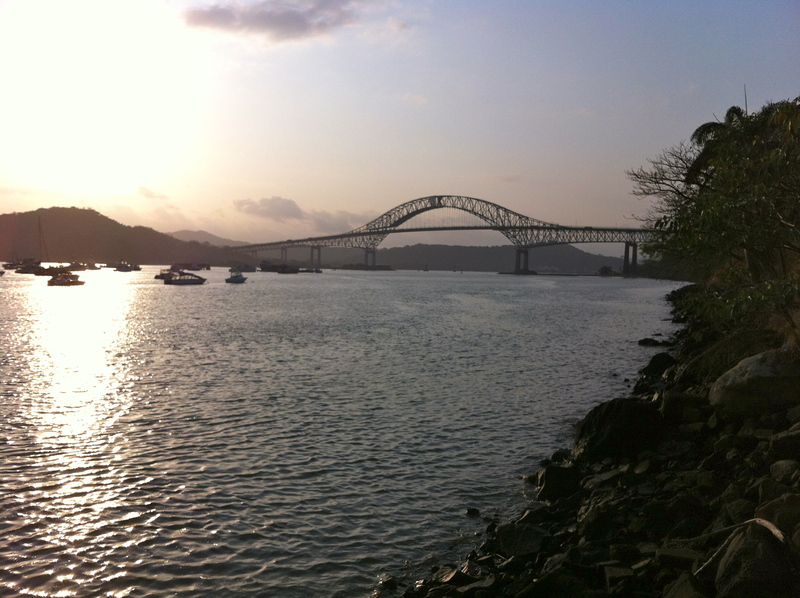 The Bridge of the America’s spanning the Pacific entrance to the Panama Canal. After failing to find an empty taxi, I walked back to hostel through a so-called sketchy neighborhood. Everyone I walked by stared at me, confused as to why I would ever venture here. 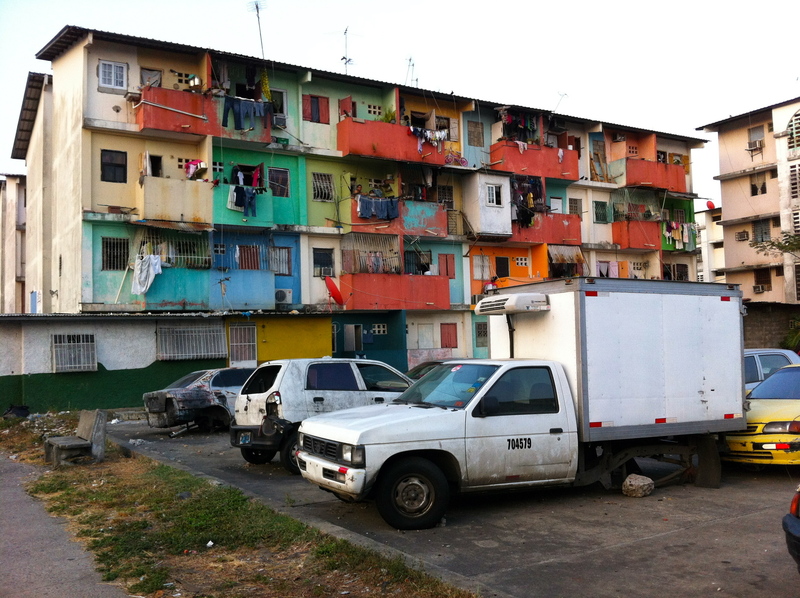 Even though it was considered extremely dangerous, I thoroughly enjoyed walking through the neighborhood because there were no tourists and gave a glimpse into the real Panama. Everyone blasted music and people were playing soccer. I refrained from taking out my camera much to avoid any thievery. That said, all the people I passed were courteous and there cops on every corner. While I was not completely sure of the directions back to the hotel, I simply followed the direction that all the full cabs were going in–where else would they all be going besides Casco Viejo? Additionally, I acted like I knew where I was going by walking fast, looking forward and not responding to the people calling “Gringo” at me. Confidence is actually a fantastic deterrent of petty crimes. After eventually made it back without any hassles, I decided to go to an Italian restaurant next to the hostel. There, I met a beautiful Israeli woman who was also alone. She was surprised that I was Jewish and informed me that there are kosher markets in Panama City and that Jews actually control most of the commerce in Panama. Who knew?! After dinner, we decided to go to a rooftop bar in Casco together.